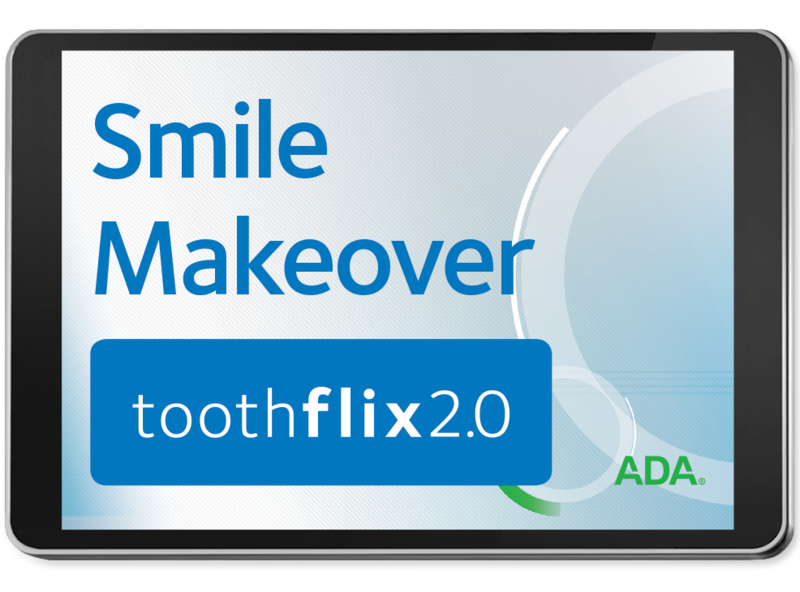 As part of our comprehensive Toothflix® 2.0 streaming video collection, Smile Makeover educates patients about dental cosmetic options. Many patients are aware of your role as decay preventer and even damage repairer. But, they may not realize their options for a better looking smile. With this video, you can guide your patients through cosmetic options and show actual results and improved confidence . From more in-depth procedures like implants to noninvasive veneers and whitening treatments, this video covers what your patients need to know about dental cosmetic options. This program delivers concise information in just over two minutes to promote an ongoing conversation between you and your patients. Perfect for treatment rooms, this streaming video will both educate and market to patients. Each Toothflix video you purchase is instantly accessible through your online ADA e-Bookself. To learn more about the Toothflix video series, visit ADA.org/toothflix. Order your Smile Makeover – Toothflix 2.0 Streaming Video today!